Not quite as decisive as half-brother Haradasun’s debut win, but more comfortably than another sibling in Elvstroem. That was the story of Comaneci’s maiden victory, which came in Sunday’s $15,000 Carer Solutions Australia 3YO Maiden Plate (1450m) at Kyneton. The daughter of High Chaparral and blue hen Circles Of Gold, who is trained by Danny O’Brien, cruised home by 3-1/4 lengths at her fourth trip to the races. In the process she became the latest in a long line products of Circles Of Gold to have won a race, which include international Group 1 winners Elvstroem and Haradasun, and jockey James Winks suspects it will not be her last. “She didn’t beat much, but she did give them a bit of a touch up,” Winks said. 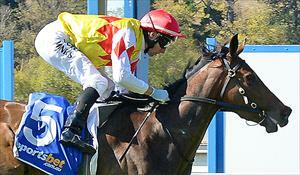 Elvstroem won by three quarters of a length on debut at Swan Hill in 2003, while three years later Haradasdun scored a runaway 10-length win in the corresponding event at the same track. Comaneci, a three-year-old, had two starts in spring; a third over 1100m at Bendigo on debut before a fifth placing in a 1400m race at Ballarat. She resumed with a second placing over 1109m at Kyneton and showed her appreciation for the step up in trip with a dominant on-pace effort at the same track. Winks was impressed by Comaneci’s temperament, which he said will assist her when O’Brien steps her further out in trip. “She bounced straight on the lure and worked with me the whole race, whatever speed I wanted to go she did and had it pretty easy,” Winks said. “I just elected to slide her into the corner and kicked off the bend and she won well. Comaneci’s win was the first leg of a running double aboard blueblood gallopers for Winks, who followed up with victory aboard Lucques in the $15,000 Holly’s Breakfast BM70 Handicap (1850m). The Mathew Ellerton and Simon Zahra-trained three-year-old all but booked his trip to Adelaide for the Group 1 South Australian Derby (2500m) on 9 May. There he will be out to emulate half-brother Rebel Raider, who won the 2009 SA Derby after winning the Victorian equivalent the previous spring.